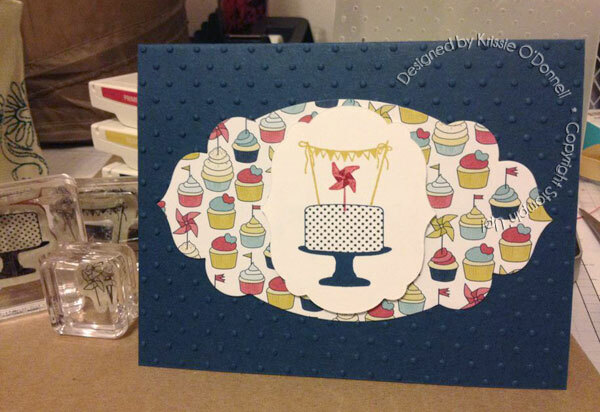 Stampin’ Up likes to reward their demonstrators and this stamp set and designer paper was part of a great gift for recruiting a demonstrator during Sale-a-bration. They are now offerring this as a bonus to anyone who signs up in June as a demonstrator with the $99 starter kit along with a great digital kit for My Digital Studio! This is the free make and take at my Catalog Kickoff party this Saturday at 1pm. There will be a great doorprize for coming, bringing a guest and/or making a purchase. I’m also selling my retired items with a BOGO deal, buy a retired item at retail price and get the same amount in new catalog merchandise free! (Tax and Shipping will be added). Must come to my new catalog party to get the deals! Thanks for stopping by my blog today. That Doodle circle is printed right on the circle on the dsp. Super cute and already embellished! Woo Hoo!